I just finished this motif for Sarma on her round robin block. Sarma's block is lovely and in the booklet she sent along, she talked about the forest and her love for walking through the woods and everything she enjoys about it. So, this is the theme for her block and I wanted to give her as many of the enjoyable things about it as I could. So, the first thing I stitched for her is this strawberry motif. Picking berries is a great part of a walk in the woods. I thought it might be interesting to walk through how I create a motif like this. It is so great to free yourself from copying other people's designs and strike out on your own. Having said that, though, the first thing I did was google "strawberry plant images". Most of what came up were commercial plants which made my mind click that what I was looking for was wild strawberries so back to google I went. I don't copy the photo per se but instead use it to remind me of the characteristics of the plant I want to stitch. I used the last Build a Seam (BAS) Challenge, Van Dyke Stitch, to create the leaves for the plant. The photos I looked at reminded me about the long leggy stems on wild strawberries that carry the fruit up to the sunshine where it can ripen. The chain stitch stems and Van Dyke stitch leaves on this plant are worked in good old DMC cotton floss, using two strands. I added the berries next, working them up in a bright red pearl cotton using padded satin stitch. The green DMC came out again and detached chain stitches formed the small leaves on the berries. They look plump and juicy enough to eat! lol Lastly, I added a couple blossoms using white silk ribbon and straight stitches. I used white thread to catch the ribbon here and there and manipulate it into the shapes I wanted. A single strand of yellow DMC and french knots added the centers to the blossoms. The last touch was the colouring on the center portion of the silk ribbon blossoms. I used a yelow water colour pencil and then a q-tip to moisten it and spread it where I wanted. I like how this motif turned out and can't wait to get back to stitching in "Sarma's woods"! These boxes are one way I have come up with to use the blocks in a way that allows each one to shine on its own and to be on display. I am always on the lookout for suitable boxes on my thrift store hunting expeditions. The white one here was an unfinished box that had a woven wood insert in the top portion as well. On this one my husband was kind enough to cut out the top woven section with an exacto knife and paint the box white for me. Yes, I can paint but he is much better at masking than I am so I did not end up with white hinges and latch as well this way. I used the standard method of lacing the block around a piece of mat board cut to size and then glued the mat board into the top of the box. In this case I used a piece of trim around the join to hide any imperfections in my construction. The foremost box shown was a box intended for storing photographs and had a space in the top to place a photo on display. It is a simple matter to display a block laced around a thin piece of cardboard instead and since the box is already set up to facilitate display, there was no deconstructing of the box necessary. The box at the back has a nice deep display area - originally it held pieces of nasty plastic dimensional miniature furniture. The box itself though was a lovely wooden one and just waiting to be used for something nicer. On this one it was necessary to pop off the piece of wood on the inside of the lid and remove the original display matter. Once again I laced a favourite round robin block around a piece of mat board cut to the correct size. Inserting the block into a deep framework like this box had allows for using a more dimensional piece of stitching - lots of room for buttons, silk ribbon embroidery, etc. without it being crushed or distorted. The box also had a piece of glass in place to protect the stitching. I used E6000 to reglue the piece of wood from the inside of the lid back into place and it all looks like this was the original intention for the box! I hope you enjoyed the explanation of how I used these round robin blocks and that you will be inspired to search out suitable boxes like this to display pieces of stitching you have. If you are looking for more ideas, check out the linky party at Pigtales and Quilts for more ideas on finishing up your quilting UFOs! 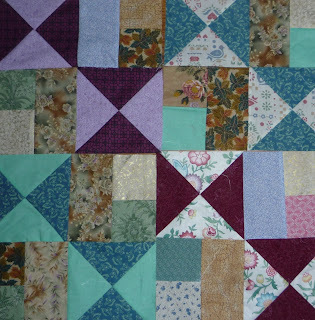 I was so happy when I visited the AAQI website today and discovered that "Kimono Girl", this little crazy quilt I made for AAQI has sold and raised another $85 for Alzheimer's Disease Research! Yay! Just a note to say the latest issue of CQ Mag Online (the great online crazy quilting magazine by crazy quilters for crazy quilters - FREE!) is online. I haven't been posting much the last little while because I haven't been getting a lot of stitching done. Instead, I have been working on a Basic Colour Theory class over at the Stitchmap Yahoo Group. This is a great group by the way, where you can take free online classes on all kinds of stitch techniques. The classes are very high quality and you are matched with a mentor to assist you one-on-one. These are some of the samples I have been stitching for my class notebook. Achromatic - colour scheme that uses no colours, only black, white and greys. Monochromatic - colour schemes that use tints, tones and shades of only one colour. Analagous - colour scheme that uses different tins, tones and shades of three or four colours that are next to each other on the colour wheel. Complementary - colour scheme that uses tints, tones and shades of a colour and its complement. So, as you can see, I haven't totally been slacking off! I hope that I will finally get a handle on this colour theory now and be able to use it effectively in my stitching. This is one of my two laundry tubs that hold scraps of quilting fabric that are too small to fold up and stack with the fat quarters and fat quarter wannabes. So, when I got to choose the block for the monthly lottery over at the Mailblocks Yahoo group, I knew I wanted it to be a good stashbusting block. I ended up choosing "Scrapbagger" from Quilter's Cache. Here are my five blocks I made up yesterday on my day off. Every scrap came from the scrap basket so I am happy. They are off in the mail today to the happy winner of the monthly lottery. It is fun to look at a photo of what could end up being a section of the finished quilt - you can start to see the secondary patterns forming. Making these lottery blocks always makes me want to make a whole quilt myself from the pattern! I just received a great little bead book in the mail from Meg: Bead Embroidery - The Complete Guide. It looks like a good resource and I'm looking forward to delving deeper into it. I have to say I love books in this format with the small size (perfect for toting around) and the coil binding inside so it stays flat for you while you are working. Looks like lots of great instructions which will be a great help working on the Bead Journal Project this year. This was a prize from a draw of names from the December monthly challenge at CQI. Thanks Meg! I suspect anyone who follows my blog is getting tired of seeing this block! lol I promise this will be the last time. I have sewn it up and it is already in an envelope waiting for the post office to open so it can begin its journey to the Alzheimer's Art Quilt Initiative. This quilt marks a sort of milestone for me with AAQI. This is the 12th month in a row I have donated a quilt to AAQI and I am pretty pleased with myself. I intend to continue on in the coming year as well. I usually finish off the back of these little quilts with Fast Finish Triangles - a great and easy way to allow for hanging the quilt. As you can see,my quilt is #9272, which means another big milestone for AAQI is approaching. It won't be long before the 10,000th quilt is made and donated by someone! I enjoyed this week's TAST, the feather stitch. For more details on the TAST (Take a Stitch Tuesday) Challenge, please visit the information page on Sharon B's Pintangle blog. Above are the three variations of Feather Stitch which were the BAS (Build a Seam) Challenge stitch for this week here on my blog - a happy coincidence for me since I only had to stitch once for both challenges! A full list of the BAS stitches can be found by scrolling down the sidebar to the right. The details of these particular stitches are in my last post. I also did a patch on my block with the feather stitches I use often for under the sea growth. After completing the feather stitches, I have decided that this block Juli made for me at Christmas is embellished enough. It is not the usual encrusting but I like the way the stitching is stealing the show and don't think it needs a bunch of lace and charms etc to carry it. I'll be finishing it up now as my AAQI quilt donation for January. Ta-dah! Does that make three birds with one stone?? One last thing - I have been visiting many of the samples of Feather Stitch in the comments on Sharon's blog and I have an absolute fabourite. If you haven't seen it, check out Gayle Schipper's Tessalating Fish Lips! As much as I wanted to continue doing this block all in fly stitch, I decided I would get hopelessly behind if I didn't move on to the second week and do some buttonhole stitch. I didn't get a whole lot done but did try some variations of the stitch that were new to me so I think I did all right in the spirit of the challenge. The first seam I added was a Double Buttonhole Stitch - simple but effective. I used blue silk to make a simple buttonhole stitch of staggered heights and then wrapped the base in red thread. Never thought of wrapping buttonhole stitch before! This one is a Crossed Buttonhole Stitch which was a tiny bit mind bending for me. Two for one! At the bottom is another buttonhole stitch of staggered heights and at the top is a closed buttonhole stitch. The inspiration for all these variations came from Sarah Whittle's wonderful website - check it out! Also, you can check out the guidelines for Sharon B's Take a Stitch Tuesday (TAST) Challenge here. 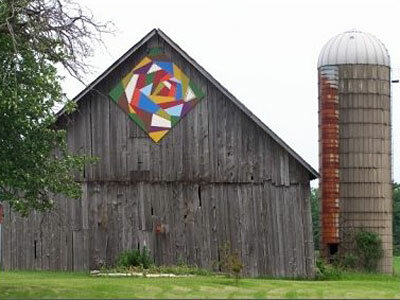 This photo has little to do with my subject today but I do love crazy quilts and I do love barn quilts, so there you go! 2012 is starting out with such a bang! There are so many challenges out there for crazy quilters right now and one of the most exciting ones coming up fast is the online quilt show at Pigtails and Quilts. Time is running out for entering so you will want to check out the details here! "Alzheimer's Illustrated: From Heartbreak to Hope" continues its five-year journey across the United States with a stop at the Mid-Atlantic Quilt Festival XXII, February 23-26, 2012. The exhibit will hang at the Hampton Roads Convention Center (Greater Chesapeake Bay / Williamsburg Area). Show hours are 10 am to 6 pm Thursday - Saturday; 10 am to 4 pm on Sunday. "Alzheimer's Illustrated: From Heartbreak to Hope" is an exhibit of quilts about Alzheimer's sponsored by the Alzheimer's Art Quilt Initiative (AAQI). Fifty-four small format art quilts (9" x 12") illustrate the disease from a variety of perspectives. They hang among 182 "Name Quilts," each 6 inches wide and 7 feet tall, which carry the names of more than 10,000 individuals who have/had Alzheimer's or a related dementia. The names of loved ones, written on fabric patches by family members and friends, honor the 5.4 million Americans in the United States struggling with Alzheimer's disease. If you live nearby and get a chance to visit the exhibit, say "hi" to my little Forget-me-Not quilt for me! Don't forget! The AAQI quilt auction for January ends tonight so check out the quilts while you have a chance by clicking here. Scroll down a bit to see the beauties up on the block this month! This is the stitching I did with Fly Stitch, working on Sharon B's TAST (Take a Stitch Tuesday) challenge you can find on her Pintangles blog. For details on TAST, click on the icon on the right hand side of my blog. It will take you to her site and tell you all about it. I knew that I wanted to attempt a dandelion after seeing some samples done so here is my take on it. The heads of the dandelions as well as the seeds in the wind are all fly stitch. The stems were a bit of a cheat, being made of chain stitch, but the leaves are all fly stitch as well. The simple fly stitch seam underneath was the first thing I did and it will have to come out since I think it interferes with the dandelion head. Above there is a green stem stitch stem meandering across a seam with fly stitch leaves on along the way. Each little flower or bud was made with two bullion stitches. I did this seam in Arrowhead Fly Stitch, using a wonderful soft silk thread I found at Shuttleworks. I used the same stitch for this variation called Fly Stitch Garland. This last one, in the same thread, is called Double Fly Stitch, a rather wide fly stitch with a longer narrower one over it in a contrasting colour. I had hoped to finish this block (which you might recognize as being one I received wrapped around a Christmas Cracker) entirely in Fly Stitch but time got away from me and this was as far as I got. I am undecided now on whether to go ahead with the fly stitch variations to complete the block or move on to this week's challenge, buttonhole stitch, on another block and have this end up as yet another UFO. Tuesday came too soon and it's only the first week of the challenge! I received a wonderful package in the mail this week - a pincushion made by my friend, Gerry! Gerry is famous for her hand painted buttons but before she started that she was making these wonderful pincushions! If you check out her Etsy shop, you will see she is now selling kits very reasonably so that you can make your own. I do not need to make one though since I have been blessed with one of her originals! I am tickled pink with this beauty. Thank you Gerry! Well, this is a bit exciting! I made the local paper - they have published an article on me as Artist of the Month for the county! I am really hoping enough people will stop by the Vulcan County Office and see the pieces of crazy quilting and get interested so that there will be enough people registered for me to teach a class here locally! You can check out the article here. I took in a collection of my favourite pieces of crazy quilting EARLY in the morning Monday so we could set them up. I had to be there when the office opened so that I could get back in time for work so got to enjoy a beautiful sunrise on the drive. This is a piece I couldn't wait to share with everyone! You will notice that I immediately picked it up to hold when the reporter asked to take a photo for the article! I finally got my beautiful block back from the framers after Gerry finished working her magic on it! If it looks familar you likely saw it on Gerry's "Block Talk" Blog! When it came back from the original round robin there were problems with the block which Gerry was kind enough to fix for me. She is also the one who stitched all the beautiful dragonflies for me on the original block so it seemed perfect that she would come up with the idea of the little frog in the corner! This little Christmas Stocking is also hanging in the Artist of the Month exhibit. This is the sample from the class that didn't run because of lack of registration. I was disappointed that I didn't get to teach this class in Vulcan because I think people would have enjoyed making it - maybe next year! These are a couple of little six inch Christmas blocks. I have been on a framing and finishing frenzy over the last couple weeks getting things ready that I could hang in the exhibit to entice people into the wonderful world of crazy quilting. I only managed to get the first dragonfly block framed professionally because I knew it was one I would treasure and keep for myself forever. All the rest of these are framed by myself in thrift store frames. It shows - lol! This one is a spring themed block - I don`t usually work in pastels so it was a fun change. I finally gave it a try getting out my needle and thread and lacing the blocks onto the backing in the proper method. I can see why it is recommended - a big improvement over my previous method. This one is one of my earlier pieces but it was good to finally finish it in some way so that it got out of the pile of finished blocks I have never done anything with. I love to explore ways to use cq pieces that avoid the cost of framing so I used a table in the County Office in Vulcan to display some boxes I put crazy quilt tops in, the denim cushion I made for dd when she returned from Brazil, and a pincushion, Notice I finally put together the tea cozy - this stitching has been the header of my blog for ages and I had never finished putting it together until now! I wish all my stitching friends lived close in Vulcan County so they could stop in to see the pieces and cheer me on!